You Will See How it Works, Get Free Reports & Consultations. Your organic traffic is getting down, then it is the right time to start using our service. f you lost your Google positions, we would be glad to help you and solve the problem. 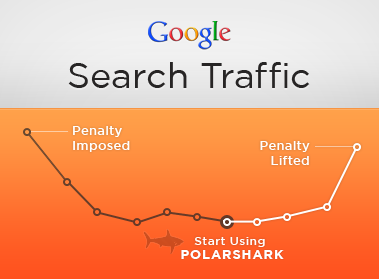 If you got a penalty from Google, then the Polar Shark package would get you out of filters quickly. We will delete all your unnatural backlinks, will write a reconsideration request and will get your positions back. We start from your unnatural links. We use 24 different link sourses to get your all links, after we start analisys and give you clear report with instructions why you should disavow exactly that links and how you should make this. After getting rid of your unnatural backlinks, we make full & deep ON-Page Optimization with fixing all bugs, errors and Google TOS VioLations. If you don't have someone in your team to make this, our manager will make it by himself. When all ON-Page & Off-Page Cleaning is done, we write to google reconsideration team with special templates which in 90% force them return your rankings back. In our reconsideration letter we attach list of all changes we made and doc with all links which we disavowed. Copyright © 2013 Crork Service. All Rights Reserved.